Mike and I had a fantastic meal out on Saturday night at Brassiere One, in Martinborough. They served an amuse bouche, so named because it’s a bite sized tantaliser, but not big enough to be called an entree. 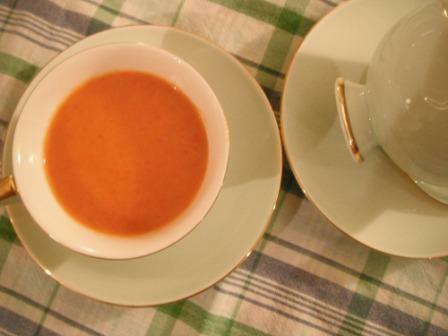 It was an espresso cup of creamy roasted red pepper soup with a delightful kick of chilli. I tried to replicate it tonight by roasting peppers and tomatoes, and then cooking the flesh (seeds removed) with thinly diced onion, small pieces of potatoes, and chicken stock. When it was soft, I pureed it and then sieved it to remove any left over seeds. It needed quite a bit of seasoning so I added pepper salt and then the chipotle chilli powder to taste. Just before seving I stirred in some cream. Wow! It had a bit more kick than the one in the restaurant, but perfect for our palate.